I was on the prowl for a New Yorker article by Jose Vargas titled "The Face of Facebook" which is a great in-depth with FB founder, Mark Zuckerberg. 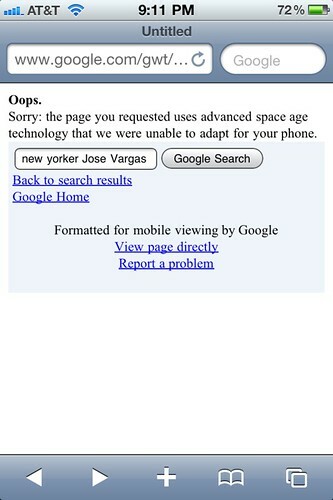 I was conducting this search on my beloved iPhone, when Google, my search engine of choice, returned this message. Does that sorta feel like a swipe at one turtlenecked iCEO?